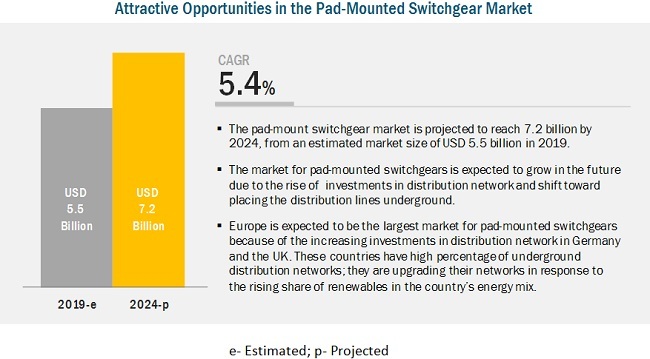 The report “Pad-Mounted Switchgear Market by Type (Air insulated , Gas insulated, & Others), by Voltage Rating (0-15kV, 16-25kV, & Above 25kV), by Application (Industrial, Commercial, & Residential) & by Region - Global Trends & Forecast to 2020”, defines and segments the global Pad-mounted Switchgear market with an analysis and forecast of the market size. Pad-mounted Switchgear market is expected to grow from an estimated USD 4.07 Billion in 2015 to USD 6.3 Billion by 2020, at a CAGR of 9.1% from 2015 to 2020. Increasing T&D infrastructure investments and growing trend toward undergrounding are driving the Pad-mounted Switchgear market for across the globe. Amongst the two major type of pad-mounted switchgears, air insulated pad-mounted switchgear is more used due to its economic viability. It currently holds nearly half of the total pad-mounted switchgear market. In areas with extensive space, air insulated switchgears are the primary choice due to its low construction costs. In this report, the air insulated switchgears have been further segmented by voltage ranges into 0-15 kV, 16-25KV, and above 25 kV. The report also segments pad-mounted Switchgear market on the basis of its application, which includes industrial, commercial and residential. Industrial sector requires highly reliable power supply for continuous, optimum operations, leading to demand for uninterrupted underground distribution systems. In the coming years, pad-mounted switchgear in the industrial segment is expected to grow at a higher CAGR of 9.1% during the forecast period. In this report, the Pad-mounted Switchgear market has been analyzed with respect to five regions, namely, North America, Europe, Asia-Pacific, Middle East & Africa and South &Central America. Europe will continue to dominate the market with increasing investment on T&D infrastructure and growing trend towards placing electrical lines underground. The figure below shows the Pad-mounted Switchgear market on the basis of its region for the year 2014. To provide an in-depth understanding of the competitive landscape, the report includes profiles of some of the leading players in the Pad-mounted Switchgear market include Eaton Corporation plc(Ireland), G&W Electric (U.S.), Hubbel Incorporated(U.S.), S&C Electric Company (U.S.), and Federal Pacific (U.S.) among others. Dominant players are trying to penetrate developing economies and adopting various methods to grab the market share. Market share analysis by revenue for key companies is included in the report. The scope accordingly aids market participants to identify high growth markets and help managing key investment decisions. For this report, major players in the Pad-mounted Switchgear market have been identified using various primary and secondary sources, which include annual reports of top market players, interviews with key opinion leaders such as CEOs, directors, and marketing people. Based on this research, the market shares have been evaluated and validated.